En 1955, quelques mois après la disparition de Charlie Parker, Julian "Cannonball" Adderley fait le "beuf" à New York avec la formation d’Oscar Pettiford. Son improvisation sur I'll Remember April fera de lui un nouveau messie du sax alto. La présente sélection fait entendre des enregistrements réalisés au cours de sa première année new-yorkaise. Déjà se pressent autour de lui nombre de musiciens fameux et confirmés qui se portent ainsi garants de son talent exceptionnel. 1.Cannonball04:14 (Julian Adderley) The Julian "Cannonball" Adderley Orchesrtra : Nat Adderley (cnt), Julian "Cannonball" Adderley (as), J.J. Johnson (tb), Jerome Richardson (ts), Cecil Payne (bar), John Williams (p), Paul Chambers (b), Kenny Clarke (d), Quincy Jones (arr). 2.Everglade03:41 (Julian Adderley / Quincy Jones) same as 1. 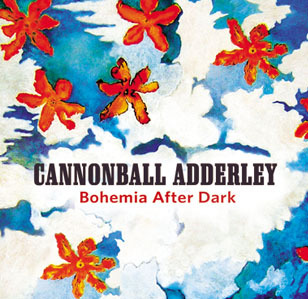 3.Bohemia After Dark06:05 (Oscar Petitford) Donald Byrd (tp), Nat Adderley (cnt), Julian "Cannonball" Adderley (as), Horace Silver (p), Paul Chambers (b), Kenny Clarke (d). 4.Fallen Feathers03:45 (Quincy Jones) Same as 1 except Max Roach (d) replaces Kenny Clarke. 5.Caribean Cutie07:00 (Julian Adderley) The Cannonball Adderley Quintet: Nat Adderley (cnt), Julian "Cannonball" Adderley (as), Hank Jones (p), Paul Chambers (b), Kenny Clarke (d). 6.Willow Weep For Me06:19 (Ann Ronell - Ann Ronell) same as 3. 7.You'd Be So Nice To Come Home To03:36 (Cole Porter - Cole Porter) same as 1. 8.A Little Taste05:06 (Julian Adderley) same as 5. 9.I've Never Been In Love Before02:19 (Frank Loesser - Frank Loesser) Julian "Cannonball" Adderley and Strings : Julian "Cannonball" Adderley (as) with orchestra conducted by Richard Hayman (arr). 10.Falling In Love With Love02:31 (Lorenz Hart - Richard Rodgers) same as 9. 11.New Arrival06:39 (Nat Adderley / Julian Adderley) The Nat Adderley Quintet : Nat Adderley (cnt), Julian "Cannonball" Adderley (as), Horace Silver (p), Paul Chambers (b), Roy Haynes (d). 12.I Should Care04:26 (Sammy Cahn / Axel Stordhal / Paul Weston) same as 11. 13.Crazy Baby06:01 (Nat Adderley / Julian Adderley) same as 11. 14.Polka Dots And Moonbeams03:04 (Johnny Burke - Jimmy Van Heusen) same as 9. 15.The Song Is You04:13 (Jerome Kern - Oscar Hammerstein II) The Julian "Cannonball" Adderley Orchesrtra : Nat Adderley (cnt), Julian "Cannonball" Adderley (as), Jimmy Cleveland (tb), Jerome Richardson (ts), Cecil Payne (bar), John Williams (p), Paul Chambers (b), Kenny Clarke (d), Quincy Jones (arr).